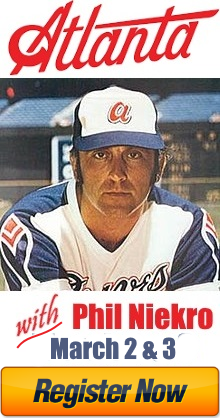 Welcome to The Knuckleball Network. I’m hoping to really grow this social network to connect every knuckleballer in the country. A lefty knuckleballer? I’m jealous. I’ve only ever seen one other. He’s a college knuckler from Texas and I’m sure he’ll sign up here soon. What’s your name? Where are you from? Hi Chris, I am Kade Hunkapiller from Venice FL, I played 2 years with State College of Florida Junior College and now transferred with a athletic scholarship to play for Lyon’s college in Batesville, AR. I am self taught and have been throwing the knuckle ball for about 6 years. Hopefully we can get the word out about Knuckleballer’s. Running into any bias with the pitch? Also, I’ve seen some video of you throwing. How hard are you humming that thing? You are also getting a bit of recoil in your delivery which may cause some spin. Welcome to The Knuckleball Network. I’m hoping to really grow this social network to connect every knuckleballer in the country. What’s your name? Where are you from? my name is Anselm and I throw the knuckleball here in Germany. I’m 28 and I’ve been playing baseball for something around 13 years now. My team is located in the Munich region, we don’t play professionally, since that’s not really possible here. But we do have league games almost every weekend. I will actually be in Munich at the end of the month for Oktoberfest. We should meet up! I’ll email you with more. That’s awesome, feel free to email me anytime! My son had a great day today in the backyard. Everything wasn’t spinning and he was near the zone. I could barely catch it. I wish he would throw like this every day. On his bad days, we just focus on what’s in the program. We just got to get him throwing it harder now. Joining the discussion. Me and my 16-year-old son are up in the Bay Area of Nor Cal! Anyone else learning the pitch in that area? I’m down here in Los Angeles during the off-season and am always available for some lessons. Let me know if you’re ever down here and we’ll chuck some knucks! My work brings me down there from time to time. School has started up again which makes it tough, but I will definitely try to make a trip down there with my son! Excited to meet other families to see if they are experiencing the same thing that we are with this pitch. It can be frustrating. My son is a junior in high school. I think you’ll be shocked at how many stories there are of knuckleball bias in the baseball world. Charlie Hough has even told me stories of being held back during his 24-year MLB career. Happens to all of us. Yeah, we’re up here in Canada but we are thinking about going to the annual Vegas Clinic in October. I’m so excited about this new site. My 14yo wants to be the next RA Dickey. I hope we get to meet him someday! We’d like to meet him, too! Where do you and your son live? Looks like Billy lives up in Quebec, about as far from San Diego as it gets. You can always look at other people’s profiles to see where they live. Each phase of the Program is a booklet with an accompanying DVD. 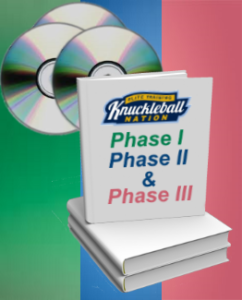 Buy each phase individually or order all three for a discount. Click here to order.